Titan Books’ flawlessly crafted Man of Steel: Inside the Legendary World of Superman, a sturdy and imposing coffee table book (with a stunning embossed textured cover) devoted to exploring the aesthetics and the extraordinary creative process behind the new groundbreaking film, is an essential companion for any fan. The exciting and intimate 184 page volume captures the rigorous efforts of acclaimed director Zach Snyder (300, Watchmen) and producer Christopher Nolan (The Dark Knight Trilogy) to bring the comic book icon back to the big screen through a series of visually striking concept art and exclusive behind-the-scenes photography. The marvelously oversized hardcover tome (286 x 240 x 22mm) weighs in on unanswered questions and, even after a second read through, remains informative. 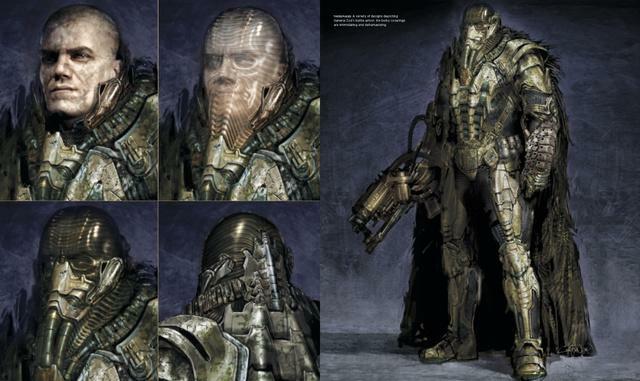 Author Daniel Wallace, a comic book expert and sci-fi sage, has managed to compile a rich selection of production art, stills and designs from the secret lairs of the Weta Workshop and mixed them with interviews with the extensive cast and crew (including Christopher Nolan, Henry Cavill, Zach Snyder, etc). Laid out across eye-popping double-page spreads that evoke true excitement, the stunning imagery of Krypton literally jumps off of each page. There simply is no shortage of material or visuals for your eyes to soak up and take in. It’s all here, down to the fine details – right down to the Kryptonian language created by Christine Schreyer. After a foreword by Christopher Nolan (detailing his love for the 1978 Richard Donner Superman) and an introduction from Zach Snyder, Inside the Legendary World of Superman is split up into five major chapters; Modern-Day Mythmaking, Casting Man of Steel, Welcome to Krypton, Welcome to Earth and The Heart of The Legend. 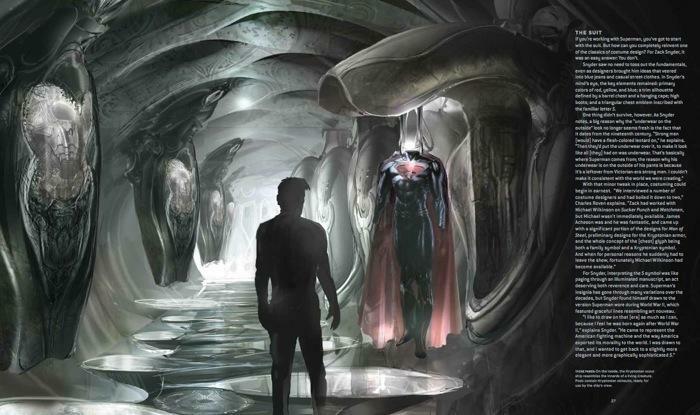 Modern-Day Mythmaking starts off with Making It Happen – the story of how Goyer first shared his concept for Man of Steel with Nolan and how Nolan, in return, shared the concept with Snyder. It continues with Making It Real, a brief walkthrough on Snyder’s approach to the character. The Suit documents the difficulties the crew faced when creating a new, modern and believable suit (one without underwear). Casting of Man of Steel deals with actor profiles and their comments regarding their characters (how they were cast and their understanding of their comic book counterparts). Welcome to Krypton, the highlight of the book, showcases the city of Kandor and its inhabitants (which include its bizarre four-legged creatures, the robotic attendants and even the flora). Welcome to Earth shows off the sets of Smallville, U.S. Northcom and of course, Metropolis (which happens to be Chicago and not New York). Finally, The Heart of The Legend explains some of Superman’s emotions and reasoning within the film. Here Wallace tackles some of the hard-hitting questions of the who, why and how of the film. 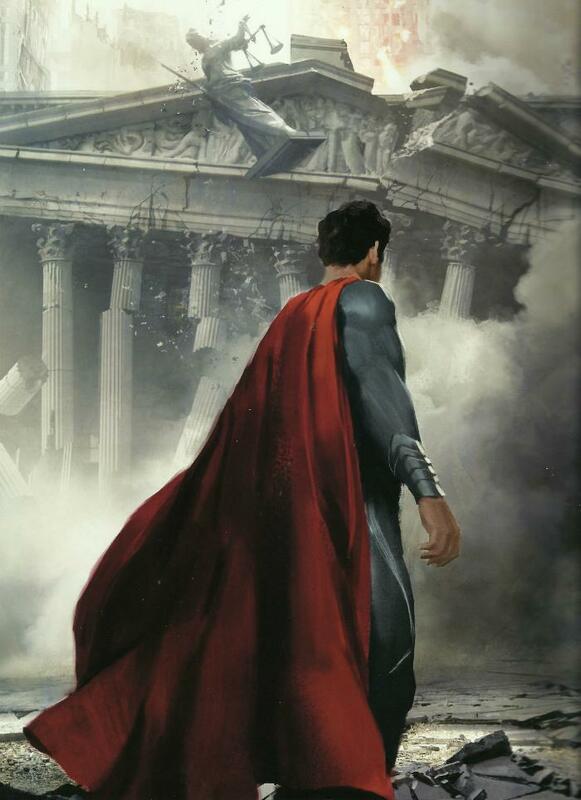 Ultimately, Man of Steel: Inside the Legendary World of Superman deserves to be in your library. It’s honestly one of the finest books in my collection. 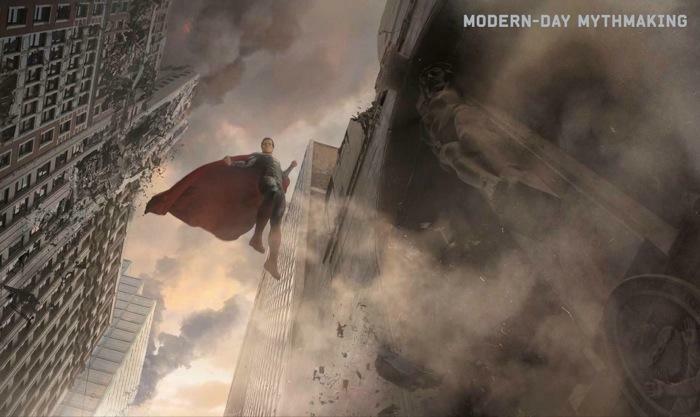 As the dust and rubble from the epic fight’s destruction begins to settle, fans will look back at Man of Steel as a classic. Thankfully, I’ll have this book to remind me of the amazing experience.